​​diet just like humans for optimum health! 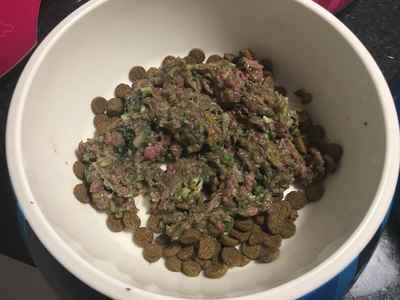 There are much healthier options than dry kibble/pellets and your schnauzers will say thank you! 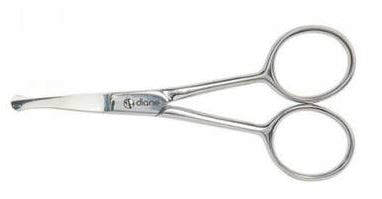 You will save on medical bills and see their coat change and they will get a sparkle in their eyes! Founder Deborah says "My precious Rosabella got very sick at age 6 months with a potentially fatal type of stomach gastro called Hemorrhagic Gastroenteritis (HGE) where they poo blood and vomit bile. It kept on happening and I was regularly at the vet with a very sick schnauzer. The vets (I went to three) would put her on a drip, prescribe some medicine, recommend I still feed only Hills dry pellets (which they sold) and charge me a fortune! I started doing my own research out of desperation and realised that nutrition had a huge role to play. Feeding dry pellets, Rosabella was on a fast food highly processed unhealthy diet and her body was resisting! Dogs needed a FRESH natural unprocessed varied balanced diet just like humans. I adjusted her diet and Rosabella got better and our regular vet visits have stopped!" Dogs need a varied diet. Imagine if you ate the same food day in and day out for your whole life. The same food everyday can also cause allergies. Schnauzers are prone to pancreatitis and hyperlipidemia. Avoid giving them any food that is high in fat or fatty titbits and treats. Vets are not dog nutritionists, and tend to treat symptoms and not the cause. Most vets just sell and push the usual processed kibble brands that all have grain and that they get commission from. This food is NOT good for your pooches! Most also still recommend annual vaccinations, which is also so out of date. They do not study nutrition and are indoctrinated by the large vet food and pharmaceutical companies. Most vets are still stuck in the dark ages and are far behind the latest dog nutrition and vaccination research. Have read of this article: What does your vet know about nutrition. A 100% FRESH, NATURAL, UNPROCESSED, VARIED and BALANCED (preferably raw) diet is the best for your schnauzer. ​Commercial packet pet food is easy but is not good for you schnauzer! Here is an article to give you an overview of what is in commercial dog food: Dogs Naturally Magazine: Nutrition. Dog Food the 10 Scary Truths. Step 1 - Learn more about healthy dog diets from the leaders in the pet world. Dr Karen Becker from Mercola Healthy Pets who is an amazing pet champion and the most followed vet in the world. Planet Paws with Rodney Habib is the largest pet health site in the world and are making huge strides in educating pet owners. Rodney's own pet dog was affected by pet food contaminated with melamine. He is now on a mission to change the world and educate pet parents. He is schnauzers Max, Rosabella, Thomas and Annabella's hero! Planet Paws: HERE’S WHY IT IS SO IMPORTANT TO ADD FRESH “HUMAN FOOD” TO YOUR PET’S DIET! Planet Paws: Rodney Habib's TEDX talk called: WHY DON’T DOGS LIVE FOREVER? 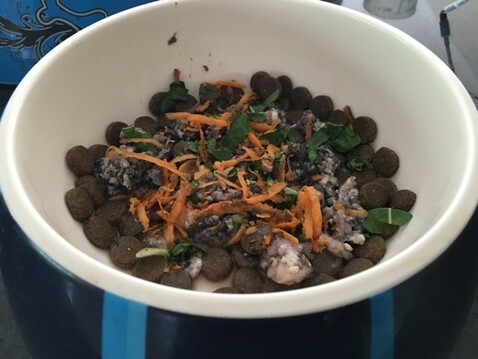 Planet Paws: Rodney Habib says "Today, the #1 reason why pet owners don't try and feed their pets a whole food diet is because of the lack of knowledge on how to "balance". Well, I sure hope this recipe we have created helps! ​Steve Marsden (Vet): Raw Pet Foods – What Does the Science Really Say? Dogs Naturally Magazine - ​Itching, yeasty ears, gas and constant licking are all signs that your dog’s food isn’t doing its job. 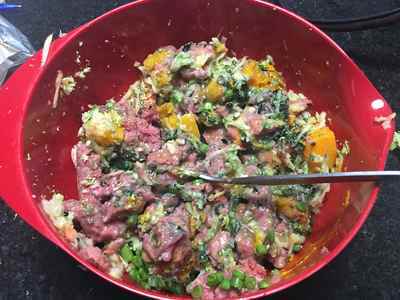 Acana, raw spinach and carrot, with the raw tripe and a dash of coconut oil. Use a good quality kibble! (Have you read the ingredient list on the kibble/pellets you are feeding your schnauzer?) After learning more, I changed from Hills and Royal Canine dry kibble to ACANA because it has a 5 star rating on the dog food advisor website and is available in South Africa. Supermarket kibble/pellets is the absolute worst you can feed your pets! 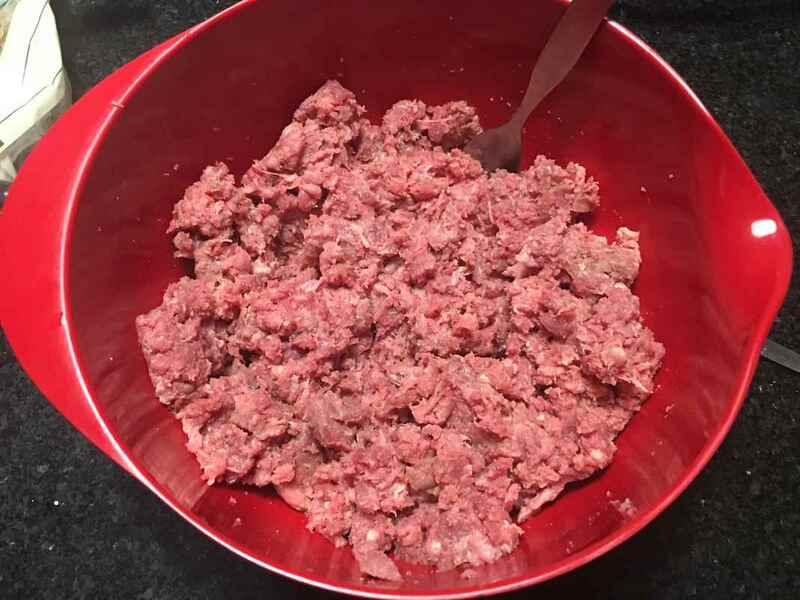 Step 2: Add fresh protein. 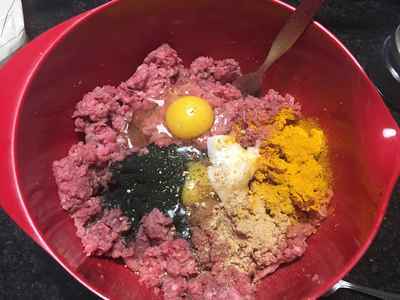 Protein like chicken, beef or ostrich, scrambled egg, tuna in brine, liver, grated biltong, chopped steak, tinned pilchards, tripe, liver or some liver bread etc. As long as it is FRESH protein, and not fatty! It doesn't matter if it is cooked or raw as long as you give them some! Maybe start with cooked and then slowly try raw as and when you are more confident. 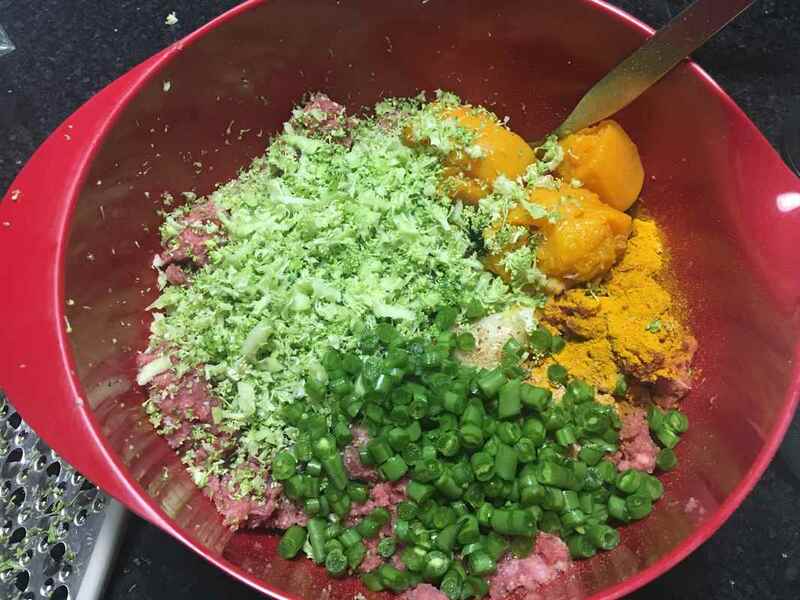 (With raw you need to ensure the ingredients are of high quality). Step 3: Add fresh vegetables/fruit. Finely chopped or grated raw spinach, broccoli, baby marrow, grated carrot or cooked pumpkin, butternut and sweet potato. Experiment here and try some fruit too - mine enjoy grated apple, blueberries. As long as it is small fine pieces, my dogs will eat. Initially they looked at me strangely, but now they gobble the vegetables and fruit. There are various supplements available, just like for humans. Add some HEALTHY oils like Miracote from the vet or coconut oil. Try adding ginger spice, tumeric spice, cinnamon spice, apple cider vinegar, fish oil, kelp powder, natural yoghurt, a probiotic etc. Add some ground bone meal from the butcher. All of these add to a varied healthy diet. Some examples of starting to add fresh protein, vegetables/fruit and supplements to your schnauzers meals. 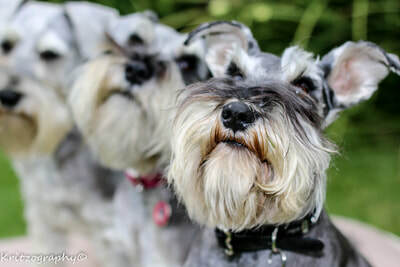 ​Once you see the positive changes in your schnauzers and you will naturally feed more and more fresh food and less and less processed pellets. 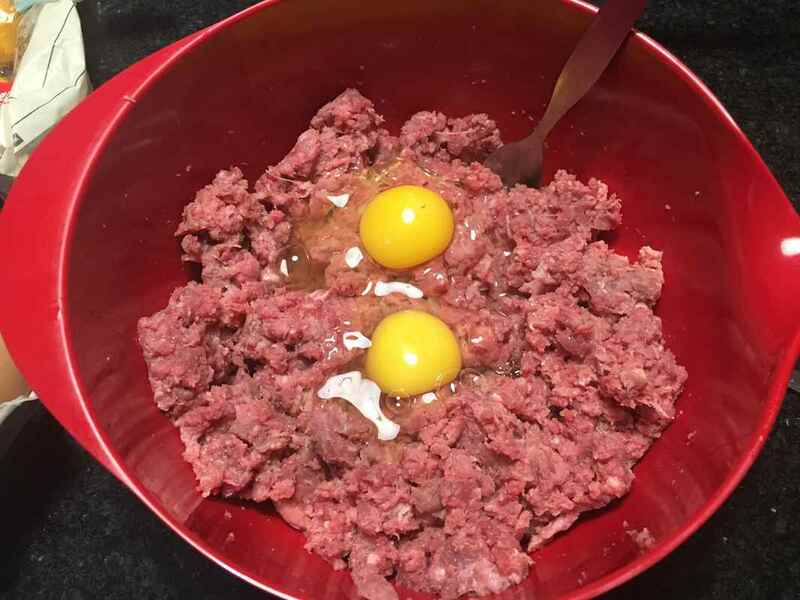 ​Over time the goal is to transition to a 100% homemade, fresh, natural, unprocessed, varied and balanced diet as recommended by Dr Karen Becker and Planet Paws. ​ Follow the balanced recipe from Planet Paws as a basis. According to most websites, dogs eat around two to three percent of their ideal adult weight per day. So for example for a 10 kg dog it would be between 200g and 300g of food a day split into two meals. If your dog is very active, you may need to feed a little more than 3%, or if your dog is more of a couch-potato, you may need to feed a little less than 2% – every dog is different. The best way to tell if you are feeding the right amount is watch the weight and condition of your dog and adjust accordingly. What do Max, Rosabella, Thomas and Annabella eat ? 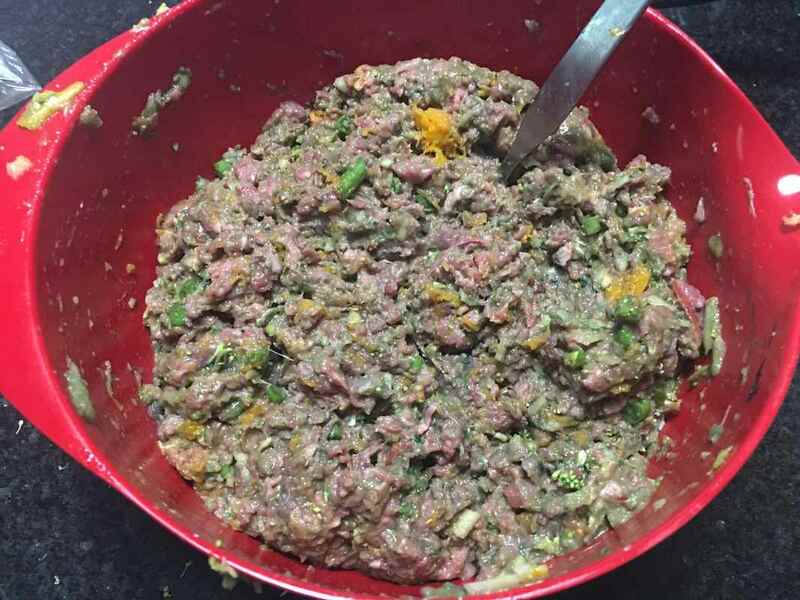 My homemade dog food following the balanced recipe from Planet paws. Based on the balanced recipe from Planet Paws with some tweaks. I feed mostly raw but you are welcome to cook the food if you prefer. This would also depend on the quality of the ingredients you are using. I often still serve this on top of a small portion of good quality ACANA pellets/kibble. 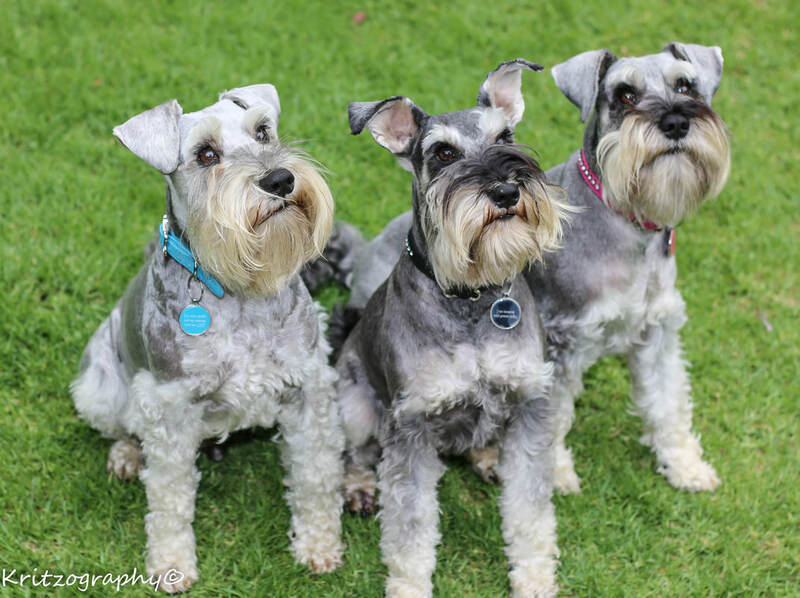 No fatty meats as schnauzers have an issue with too much fat. It must be LEAN! 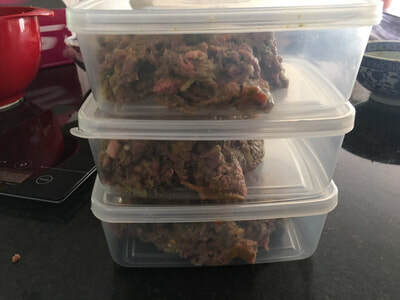 I order the above meat mix from my local butcher and get it put into 1 kg packs which I freeze, and take out and defrost as needed. If you can't get all the above the muscle meat and liver is the most important so make up the 1kg with those. The best would be free range and from a reputable butcher for the above. If you are not able to add bone meal in the meat mix then you can take a raw egg shell and grind it and add it to the mix. The above is a guide for the mix and quantities. Don't stress if it is not exact. It will balance over time just like your own diet. Or portion into dog specific serving sizes and freeze up to 3 months. Carol Colwin Pincus‎ " I want to tell everyone about my experience of changing from dry pet food to raw food. My amazing miniature schnauzer is such a fussy eater, every meal was such a stress not knowing whether he would eat or not. It could take ages to tempt him and give him bits of food with your hands to make him eat. Also, you were never sure if he was sick because he often wouldn't eat. He then stopped eating. I changed to fresh food. My life has changed completely, and my pet's life. I put the food in his bowl and by the time, I have washed my hands, all the food is gone . I sometimes have to do a double take because I can't believe it is the same dog. The change to fresh food has been so easy. I found two suppliers. 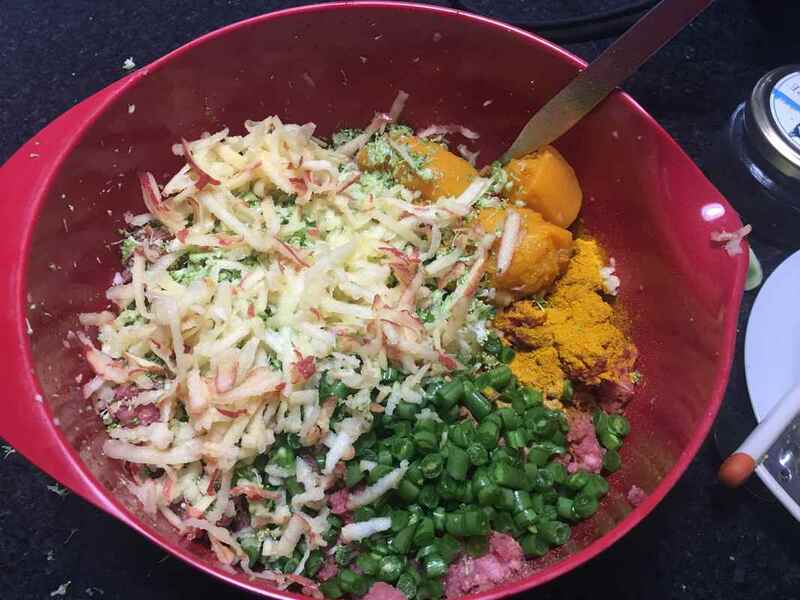 You store the food in the freezer and take it out for every meal. 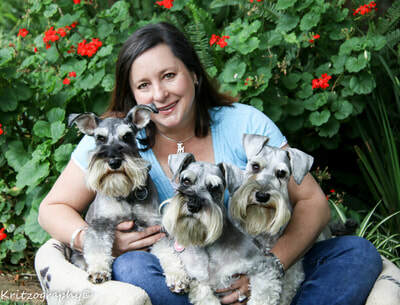 It is thanks to Schnauzer Friends and posts on this site that I was able to find excellent fresh food for my pets!" Lucy Landstone "Once you switch to raw and SEE the benefits you will never go back and no vet can tell you otherwise. All my dogs live VERY long lives, we've never had obesity issues, thyroid problems, skin conditions, diabetes or anything else. Obviously they get old and die like any other creature - but they live happy, full lives up until that point free of any of the chronic conditions that are present in so many of today's companion animals." Pia Marangoni "I had spent a fortune on prescription food - my girl was overweight and none of the "metabolic" foods did anything. I switched to raw food less than a month ago - and both my doggies are happier than ever, and my baby girl now svelte and so full of energy. I think she was just bloated from eating kibbles. My boy was such a fussy eater - now he can't wait for dinner"
Pam Du Toit "I think a varied diet is important. We have been so brain washed into thinking that feeding ONLY kibble is good because it is scientifically balanced. Nutrients come from 'food' like good sources of protein, veggies, yoghurt, fruit, herbs etc." Giulia Claire Chambers "Our little Stella one of the rescue pups, sings & dances for her Acana but if mom doesn't put veggies & yummy fresh meaty treats in her bowl there's trouble. I have found your advise to be so helpful & eye opening!! Thank you for all your tips." Feeding Dogs a More Natural Diet. A schnauzer mom's experiences. Is your schnauzer itching or licking? Avoid commercial processed treats, especially when they are coloured etc. AVOID FAT and NO RAW HIDE! Stick to healthy natural unprocessed treats. Click here for our WORLD FAMOUS schnauzer approved home made liver bread recipe and some other healthy treat ideas from Planet Paws and Dogs Naturally Magazine. WOOF WOOF!